Part 2 - Interview with a well-adjusted Womb Twin Survivor - they do exist! As a follow up to Part 1 of this interview (posted below on April 7), here concludes this very special interview with a womb twin survivor who lost his female twin at birth, and is quite fine with it. He is convinced he was spared traumatic affect due to his mother's early acknowledgment and constant communication about the loss of his twin. Consider what he shares - about a subject never spoken about with people other than his mom - an early Mother's Day tribute to the incredible instincts his mother had not to repress the loss. Let this also be a tribute to the current & future mother's of womb twins to overcome their apprehension and fears and learn to talk about it with their children. When you handle it well, your child will too. Ignoring it doesn't make it go away, it makes it much worse. What advice would you give parents of womb twin survivors on how to handle this well for their children? I wouldn’t evade it or negate it, I’d definitely talk about it. It’s something that did happen. How early would you bring it up? I would talk about it from when you brought the baby home. I remember it was a pretty early memory that I was a twin and my mother was talking to me about it, by doing that she comforted me and that’s what you want to do. Do you feel that if she told you later in life that it would’ve been shocking rather than always growing up with that knowledge? Sure because you set a tone with a child in exposing it to any kind of information or knowledge. If you do it later, it could be more of a shock and less embraceable. You might have difficulties developing that knowledge. Whereas if you get it earlier, it’s just integrated into who you are? Yes and then you have more of a possibility of developing that knowledge and nurturing it into a positive manifestation. For instance, my mother was a great artist and she chose not to teach me that when I was very young. She taught me when I was 9 or 10 and it was hard for me to assimilate that information and I was kind of upset because I wish she did teach me earlier. To use an example, prodigies like Mozart who are taught & exposed to information at a young age can assimilate that information much easier, you don’t have to think about it too much. You’re just doing it. It’s like walking and reading and talking. How would you suggest the subject be brought up? Just talk. There’s no right way or wrong way…but the wrong way is not doing anything about it all. If parents are fearful and apprehensive… look, a child only wants to share with you and other people, the more sharing and conversing is done, the more adulation and love is created. And the more love and adulation, the more intelligence is developed and the greater the perception. And that’s all that beings want is that comeraderie, all species, that is the first act of communication. Just going through the motions of eating and getting up in the morning, they emulate those things. So when you start talking about things, they’re going to emulate those things. When you do it while their young, as a parent to a child, you’re going to do it in a positive way for the most part because you’re enamored by this new being. You make it up as you go, there are no instructions on how to rear children even though there should be, but you know there are right ways and wrong ways of doing things and anything that is done in a positive, loving manner can’t be bad. If you don’t know what you’re doing and you think you’re doing it wrong, it still can’t be bad because you figure it out as you go. And not only do you figure it out, the child figures it out, you help each other. It goes back & forth. It’s a given that the teacher learns more or just as much from the student. The master really learns from the student if he’s a good teacher. And that is a very high acknowledgment in a very sagely manner, it’s not easy to do and people who are masters and have acquired that sagely manner are aware of that. That’s what you want to manifest in and it can take a lifetime to learn to do that. Or you can just do it…as your biological being tells you to do. And if you follow those things, sometimes you can learn a lot more than you knew you could. Did your mother ever tell you things about your twin that you didn’t like hearing - did she ever vent or say anything that wasn’t as palatable to you but served her more? Anything negative? Or was it all positive sharing? Pretty much, I was fortunate that she didn’t - but she did vent about her mother. Even that wasn’t accusatory, just venting issues. I remember she would say things like “there’s no such thing as better, there are just different applications or different ways of looking at things.” It instilled in me not to be judgmental. Do you think you and your mother shared the same level of grief for your twin? Did you feel on par or that there were different intensities? I guess the grief that she was dealing with, she dealt with by acknowledging it and speaking to me about it. So I was aware of it and I could acknowledge it and in doing so, that was dealing with the grief. Now, when I got older and dealt with grief with the passing of relatives, I learned a lot about grief. You have to confront grief. You have to deal with grief. If you don’t, it manifests into disease and creates illness and ill manners and ill ways. Dis-ease. So was that a delayed channeling of the grief of your twin to these other later outlets? No I don’t think so, it’s just different. Then, would you say that you grieved at the time your mother shared knowledge of your twin’s death and it was just taken care of then? As you went along? Right, exactly. That’s why I said I didn’t grieve. I think the initiation of this knowledge and the fact that this individual was no longer with us but we were discussing it – this is the acknowledgement of this information but also the embracing of the grief. Dealing with it and diminishing it at the same time. Working in tandem. To make an analogy, a relative got sick and almost died but didn’t and it was so traumatic that I grieved a real sense of loss. So later, when this person eventually died, it wasn’t as hard as it would’ve been if I hadn’t dealt with that grief earlier. I think of you deal with loss, at that time, in the moment - it creates less of a dramatic situation later, no matter what. Right, if a parent handles it well, the child can handle it well, no matter what it is. You don’t even have to handle it all that well but dealing with it is much better than not dealing with it. Even if it gets messy? Even if it gets messy because then you’ll deal with it again and it will get easier. You’re still dealing with it as opposed to not dealing with it, because you never get over the death of someone very important to you. Time is kind of irrelevant about that, it could’ve happened yesterday or twenty years ago but depending on how great that individual was in your life, you’re still going to feel that hurt and sense of loss and emotional trauma. But that’s all grief is, it’s like oh we ‘memorialize this person’ but it’s not for them it’s all for us and how we deal with these things emotionally. It’s not for the people who passed. They are wherever they go, we’re still here and it’s us that are emotionally struck by these things and a lot of times these things are not dealt with. That’s why we recreate all these stories about being haunted, we create all these things in our psyche because they’re not dealt with, all this emotional baggage turns into all these diseases whether they’re physical or psychic or psychological, they’re very real and they become very real things. They can become very psychotic, either individually or communally. So no – it just needs to be dealt with. It doesn’t matter how, it doesn’t matter if it’s the right approach or not. There’s no right way or wrong of way of dealing with this, as long as it is dealt with. 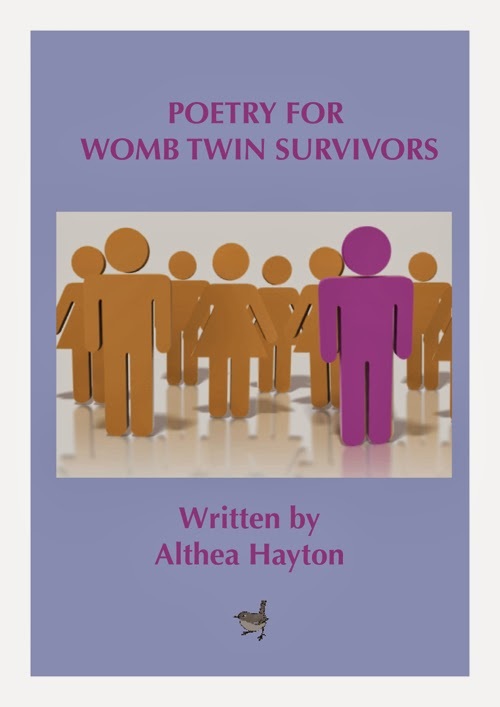 This question may not be appropriate, since you haven’t been aware of Womb Twin Syndrome, but answer it if you like: What advice would you give others who lost a twin around birth to cope? Now that I know that it is an issue, and I never knew about it personally myself, I think the best thing to do is to speak about it with other people who have gone through these experiences and to share with one another and talk about it. If you didn’t have that chance when you were a child or baby, I don’t think it’s ever too late to actually try to deal with these things. But do it with people of like mind and maybe you’ll acquire a rest in the trauma and maybe a bit of understanding on how to deal with that and try to heal. What more could you ask for? That’s what I would try to do. And I shall never see her more. I own this dvd and I recommend it. See how it is like to be with your twin in the womb. É uma história que fala do vínculo de amor, mas essencialmente da saudade. "One sees clearly only with the heart. What is essential is invisible to the eye." sais the fox tho the young prince. "The Little Prince", written by Antoine de Saint-Exupéry, has been translated into more than 200 languages and dialects. ...The narrator is dying of thirst, when he and the prince find a well. After some thought, the prince bids an emotional farewell to the narrator, explaining to him that while it will look as though he has died, he has not, he just has to return to his planet and his body is too heavy to take with him. The prince allows the snake to bite him and the next morning, when the narrator looks for the prince, he finds the boy's body has disappeared. The story ends with the description of the narrators feelings of longing for the little prince, as the he makes a plea that anyone encountering a strange child in that area who refuses to answer questions should contact the him immediately. I recently met a womb twin survivor who is quite well adjusted and ok with it all. I had to know more about his story ... what is his secret? It wasn't a secret! He and his family handled it well and it made all the difference. I just happened to meet this person and discover we both lost our twin sister at birth. He is not involved in the womb twin community and has no awareness of the healing path or that there are others like him who are on it. He struck me as a rare example of a womb twin survivor who is well adjusted and accepting of the situation and therefore free of many problems associated with the syndrome, largely in part due to the healthy way he and his family embraced the loss. There were many generations of twins in the family and this was simply his version of the twin story which was acknowledged and had its place in the family history. Unlike so many families in our culture who repress lost twins, usually out of grief and ignorance which causes further damage due to mishandling, he and his family handled it well and therefore it sits well in him. Check out Part 1 of 2 of this interview with an adult male whose fraternal twin sister was lost during the birth process, although it was understood she would go from early on (most likely due to twin-to-twin transfusion), as she was undernourished. Then stay tuned for Part 2...and more about educating parents on handling womb twin loss. Let's do what we can to minimize the damage by showing parents how to do it right!